Catherine Guillot, “La quête de l’Antiquité dans l’œuvre d’Emile René Ménard », in Bulletin de la Société d’Histoire de l’Art français, 1999, p. 331 sq. “He pushed the study of twilight hours further than anyone” wrote Lucien Simon on the retrospective of Ménard’s oeuvre organized in the year of his death at the Galerie Charpentier, in Paris. Emile Ménard’s art was shaped by a solid knowledge of ancient culture inherited from his father who was historian and editor of La Gazette des Beaux-Arts, and his uncle Louis-Nicolas, a famous writer who inspired the Parnassian movement. Ménard studied under the painters Paul Baudry, Adolphe Bouguereau at the Ecole des Beaux-Arts, and finally at the Académie Julian. 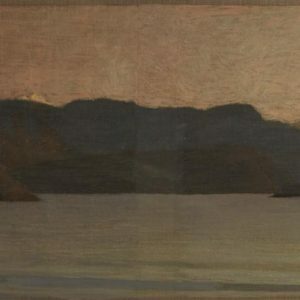 Although his first paintings were marked to a direct reference to the Bible or Antiquity, the painter evolved towards the representation of a timeless universe, which was influenced by his travels to Sicily, Greece, Palestine, and Italy, where lyrical pastoral themes evoked ancient ideal age. Ménard worked in a personal vein, marked by classical heritage as well as modernity which approached that of the Symbolists. A Member of the Munich Secession, the painter took part in the exhibition Les Peintres de l’âme in Paris in 1896, participated to La Libre Esthétique in Brussels in 1897, and then joined La Bande Noire, a protean movement, which sought to respond to the luminous coloured proliferation of Impressionism with naturalistic soberness inherited from Courbet. Marine depicts with great sobriety the shore of a calm Mediterranean, whose surface is slightly disturbed by some delicate ripples. The background is occupied by small islets and a continuous range of mountains culminating in snow-capped peaks. In Ruins, the Doric colonnade of a ruined temple stands as the sole decor of an unspoilt coast. In both silent views, the bright luminosity conveys a feeling of profoundness tinged with nostalgia. The hilly Mediterranean landscapes descend to the sea, layers of mountains ring the horizon. 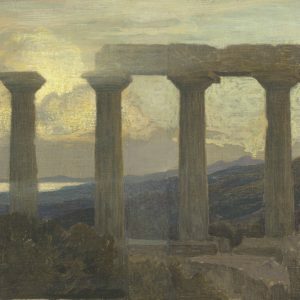 Three large diptychs found in the collections of the Musée d’Orsay in Paris illustrate Ménard’s taste for idealised classical landscapes. Entitled Rêve antique, L’âge d’or and La vie pastorale, they were undertaken in 1908 to be hung in the Faculty of Law where they remained until 1970. Here he pursued a tradition of monumental allegorical decors pioneered by Puvis de Chavannes in the 1880’s.